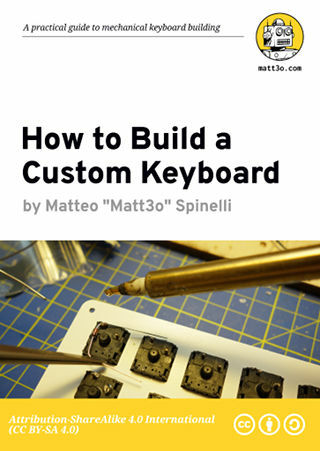 This post is part of a series about How to Build a Custom Keyboard. For easy access below you can find the complete list of articles in this category. I wrote multiple posts on my blog and on various community forums about mechanical keyboard making but the information is scattered, often outdated and unstructured. Initially I wanted to release a full book, but it would take ages and I believe it would be somewhat limited. Being able to feature a video or download the source code of a firmware is crucial so I came up with a system that would let me publish my articles in a more organic way. All chapters of the manual will be published on my blog at matt3o.com as soon as I write them. A post could cover some theory or be more practical and tutorial-like. Everything will be structured and easily accessible from the Table of Content at the top of each post so you can quickly navigate through the content. Whenever possible I’ll add videos, source code, DWG and STL files in what I hope will become a valuable and ever growing source of information for custom keyboard makers. Even better, everything is free and released under a very permissive Creative Commons license. If you wish to link or share this work please use https://matt3o.com/book. This series of tutorials are intended for makers. We will cover some theory but you’ll learn mostly by getting your hands dirty. After a few introductory chapters we’ll jump right into keyboard modding and building. We will follow a project-based approach: each chapter will guide you through building something new from the ground up and by the end of this adventure you’ll be able to plan, design, solder, program your own custom computer keyboard from scratch. It might seem overwhelming but I’ll guide you on each step. I won’t leave no stone unturned: you’ll know exactly what tools and components are needed, how to design a switch plate and where to get it laser cut, how to pick the right switches, how to solder, how to program the firmware, how to build the case and how to make it look professional even by DIY standards. There’s a lot of ground to cover, let me just introduce myself before we begin. My Name is Matteo “matt3o” Spinelli and I’m a mechanical keyboard addict. If you are into mechanical keyboards too, chances are that you own or at least came by one of my creations (being keycaps or keyboards). I always felt this craving for building and fixing things. When I was a kid I remember this urge to disassemble expensive electronic devices; if there was something moving, lighting, beeping I had to see what was the magic inside. I ended up studying art. I know, it doesn’t make sense but I couldn’t bear waiting 4-5 years in engineering; I wanted to jump right into it and build stuff. I consequently turned into a self taught generalist. I have a very basic understanding of electronics, I can vaguely hold a soldering iron, I can work my head around CAD and CAM software, I handle CNC routers and 3D printers, but I’m really not an expert in any of that. What I’m trying to say is that if I can build a keyboard from scratch, nothing stops you from doing the same. I have no superpowers and I haven’t studied anything that makes this task easier. I’m writing this manual to share my experience in building keyboards and to hopefully spare you some of the mistakes I made. I have a lenovo laptop keyboard (25214540). I try to run it on my desktop. I also find out which key on which pin. example : key (A) pin (5,7). I use “atmega32a” microcontroller but I don’t know any code to burn atmega32a. I also don’t know how to write it. plz help me. atmega32a doesn’t support USB hid natively you have to use V-USB. try to google “TMK V-USB”. I just discovered your website here, and I’m feeling inspired. There’s a project I’ve been wanting to explore for years and just never felt like I was capable of finishing it. What you are creating is exactly what I need, and I’m looking forward to following your guides. Thank you!